Some of the submissions in the inquiry have argued that online poker is a game of skill or at least one that represents a mixture of skill and chance and that players can spend longer period of time playing with without spending too much. This was his second start off a three month layoff shipping in from Fair Grounds. He was 6/10 ITM (in the money/top 3) over the Belmont Park oval. Dylan Davis was cut off sharply at the 1/16th pole by #9 /Lord of Love. He tried to get back in action but lost all momentum in the traffic, costing him all chance. Cheyanna Patrick in the saddle for Gary Patrick. She is 5/6 ITM at Belterra and the odds-on favorite this race. She was off slow and made a steady advance. Once clear she tipped off and made a strong late rally to be third this day. A little better start has her heading to the winner’s circle. Katie Clawson in the saddle for Wesley Ward. Ward had great success at Royal Ascot during the week, and now he brought a first time starter to a maiden claiming race at Belterra. He came onto the track as the odds-on choice and was green at every turn. He almost unseated the rider coming onto the track, took off from the pony, and was overall anxious. During the race he was darting in and out and finally grabbed the lead. Down the lane he started drifting and weaving and faded a bit in the stretch. I think they’ll have the bugs worked out for next race and this colt will make a good showing. This daughter of Bellamy Road was making her second start of the year. She was 4/4 ITM and all of her races came at Indiana Grand. She had a perfect stalking trip and was forced to check off heels at the top of the lane. This was just enough to take away her momentum and she still managed to mount a strong bid for 2nd money. NHC star and NTRA’s Players Committee member Ross Gallo takes a comprehensive look at the history of the National Handicapping Championship. Once upon a time, near the end of the last century, a group of horse racing dignitaries* that included my brother Randy Gallo, Steve Crist and Mandy Minger of the DRF, and professional handicapper Dave “The Maven” Gutfreund among others, gathered in a room at The Orleans in Las Vegas. This distinguished group would go on to lay the groundwork for what would become the National Handicapping Championship (NHC), a tournament like no other that was designed for the players. The basic idea was for racetracks and OTB facilities around the country to host handicapping tournaments that produced four qualifiers. These tournaments would pay back 100% of all entry fees, and the qualifiers would receive an all-expenses paid trip to the NHC finals in Las Vegas to participate in one big money final tournament. At long last, we the players, the backbone of the industry but invariably treated as the ugly step-child, had something created with just our interests in mind. This premise was very appealing to horseplayers on a financial and ego basis. With only about 200 spots available in the early years, qualifying was quite an accomplishment, and to this day the NHC is still our only tournament that you must qualify for to play in. That first tournament offered a top prize of $100,000, which was great, but payoffs only went down to 10th place. This pales in comparison to where we are now (which I’ll be covering soon), but still more than decent money. I’d like to relate a story from that inaugural event, that is an illustration of how having our own national championship immediately changed the psyche of everyone involved. Maury Wolff is a friend of my brothers. He is/was one of the most respected horse handicappers in this country, and has made a great living in this game. He qualified for that first NHC, but he wasn’t a tournament player per se and the $100,000 wasn’t going to change his life. Maury had a dismal first day, I think he had $15 or something close to that, and at dinner that night I asked him if he was disappointed. He replied, “I can’t express to you how little I care about this tournament.” Well, on day two, Maury had one of the best days the NHC has ever seen, and in the last race of the contest, he correctly chose the winner, a 9-1 shot if I recall correctly. He proceeded to jump with joy like a child as the horse crossed the finish line, thinking he won the tournament. Unfortunately (for him), Steven Walker, a great player from the Midwest, had the same horse and he would become a worthy first champion. Maury had to settle for second, but I will never forget the unbridled display of emotion that he showed that day, something I had never seen before or since from him. I am not telling this story to make Maury look contradictory in his words and actions, and please if you’re reading this Maury, don’t take it that way. I’m certain he really didn’t care all that much, but when he realized he may have won the NHC? That is an ego boost that none of us could resist. Do you know a horseplayer without an ego? I don’t, and guilty as charged. The National Thoroughbred Racing Association was formed in 1998, and their goals were simple and clear and paved with good intentions. They were going to promote racing and try to attract some new fans to our great game. Also, they would attempt to bring some uniformity to an industry that couldn’t be more splintered, with racing jurisdictions in Kentucky, New York, Illinois, Florida and California et al, playing by their own individual rules. Imagine football, baseball or basketball games where the rules change every night depending on where the games are played. In any other walk of life that would be called anarchy, but we call it Thoroughbred racing. At first the tracks were all for it, with nearly all of them signing up with the NTRA and paying their dues. It didn’t take long for everyone involved to realize that the undertaking of getting these different interests to agree on anything was akin to herding cats. And after just a few years their “Go baby go!” slogan unfortunately got up and went. The NHC was a noble creation, but in the early years it was more of an annoyance to the NTRA. They had bigger fish to fry. This is only my opinion, but I was around for most of them and I believe they felt their time was better spent on the bigger issues, not securing venues and overseeing such a large undertaking every January. I suppose I can’t blame them for that, but fortunately that mood changed as more and more tracks began pulling out of the NTRA. Ultimately, the NHC became top priority, and I think few would argue that the NTRA would have ceased to exist without it. The landscape of the NTRA was changing, and even more so the NHC. The practice of 100% payback to the players at qualifying tournaments was short-lived. I for one wasn’t happy about it, but I absolutely understood the reason. At first, if you could get 100 players or more into your building to play in a tournament, you could count on serious handle through the windows. This would offset costs and often times the tracks or OTB’s would make money or at least break even from the one or two-day event. Unfortunately a perfect storm was on the horizon. The emergence of rebate shops led to the handle at tournaments falling off precipitously. 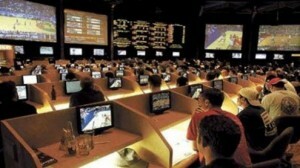 Most players were gambling on the phone or online, and it was at this same time that online tournaments began to take hold. The convenience of playing from home could not be ignored. As a result attendance at the brick and mortar tournaments began to wane as well and they were now looking to make money from the players through entry fee drags to cover expenses. It was either that or cancel their tournaments completely, which many did. So most live tournaments weren’t paying back anything close to 100-percent of entry fees and the online tournaments were all making money. [Editor’s Note: One of the few exceptions are the NYRA tournaments which still pay back 100% of the entry fees]. This practice angered many, including yours truly; but this country was built on free enterprise, and the growth that resulted for the NHC was immediate and substantial. With the revenue generated by NHC Qualify and other sites, the NTRA could charge higher fees per qualifying spot. The original purse was $200,000, the top prize $100,000 and it remained that way for the first five years. When the internet became a major player, the increases were immediate and have continued every year since with new sites popping up out of the woodwork. This year’s NHC will have an estimated purse of over $2.6 million. The original 200 entry field will swell to over 600! Personal value has decreased though, and this is not up for debate. If you play and qualify on NHC Qualify, you get the trip and entry into the tournament but no prize money. This is bad personal value, and I for one do not participate in any tournaments that choose to take this route. My brother drummed in my head to play value from a young age. He has made a living playing jackpot carryovers where your dollar is worth more than a dollar. At NHCQualify.com your dollar is worth about 70 cents. However, there is also no denying that they are one of the main contributors to the NHC’s massive growth. The prize money is huge now and interest is at an all time high and shows no signs of slowing down; even a cynic cannot argue that the current direction is not successful. They built it and we have come. I am a member of the NTRA’s Players Committee and have been since it was formed. We are a varied group of knowledgeable horse players from all points of the compass. We are not paid. We rarely agree on everything, but one thing we are all in agreement on is trying to make the both NHC and this game better. We have meetings and debate many subjects and eventually come up with a consensus, and at the end we all support the majority even if it wasn’t the idea we personally had in mind, because we believe it is for the greater good. The NTRA always has final say, but very often they relent, if they can, to our suggestions. Mike Mayo was our original chairman, and he was a wonderful leader. He passed away in 2014 and I miss him everyday. 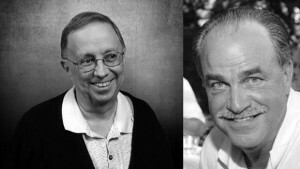 He left his mark all over the NHC and last year he was one of the two original inductees into the newly formed NHC Hall of Fame with former NHC Champ, the late Ron Rippey. Chris Larmey, one of the best players in the world is our leader now, and he has continued Mike’s legacy of excellence. The NHC has changed drastically over the last several years and one could argue that most of the changes have been for the better. The creation of the NHC Tour has increased interest and NTRA memberships have gone up every year since it began. The NHC itself has been expanded to three days from two, with only the top 10% surviving to play on day three, and finally the top ten entrants midway through day three, making for a seven-race dash to the wire. Perhaps the biggest and most significant change occurred two years ago when players were allowed to qualify twice a year, a move I was very much against because it took away the level playing field the NHC had always had, one entry one person. But again, I understood the reasoning, and it, of course, worked quite well. In the past players that would qualify earlier in the year would oftentimes shut it down, but now with the opportunity to qualify again, they would keep playing. Couple that with the guys chasing the Tour prizes, the monster purse in Vegas, the new players that have been brought to the game, and tournament participation stays vigorous throughout the year. The future looks bright for the NHC. The Daily Racing Form purchased NHC Qualify last year and they qualified a record amount of players, I’m sure you can count on more and more qualifying tournaments this coming year. More spots equals a bigger purse for the NHC, but also bigger profits for the parties involved. This tournament that was created FOR the players, has been built BY the players. I am ecstatic that the NHC has grown to what it is and am excited to see where it can eventually go, but it should be renamed, The Players Championship. The NTRA, DRF, NHC Qualify and others deserve credit for the vision they showed adapting to the times and persevering to success, but never lose sight of the fact that it is your dollars that are funding the growth. The NHC is still played under hypothetical rules, which means, scores are accumulated using track payoffs, and correct picks add to the player’s score. In recent years, real money tournaments have become popular with players and the venues. The reasons for the venue are obvious; the players are being “forced” to put their money through the windows, the scores are actually the player’s bankroll and the venue gets the handle. Real-money has been directly responsible for some tracks and OTB’s to get back into the tournament game. Theses tournaments are popular with the players because they have much more control of their fates during the tournament. In hypothetical contests, if you get behind, many times you’re stuck playing hopeless longshots. If you bring exactas and trifectas into the mix, your options increase exponentially, and real-money tournaments are more like day-to-day wagering. I believe real-money is the future, and in turn attracting television could bring the NHC full circle, back to a tournament for the players. If the prize money could be provided by a sponsor and not have to be generated by the players, then you would have a tournament that the people who came up with the idea in the first place, envisioned all along. The change to a “Final Table” of ten was designed with TV in mind. Keith Chamblin and Michele Ravencraft of the NTRA, are always trying to look to the future to make the NHC bigger and better. They work very well with The Players Committee and as I said before, they take our advice and implement suggestions when they can. Poker has been our business model. They blew up when they began to show the players hole cards. We started that a couple of years ago at the final table, showing everyone which horse each player selected before the race went off. The increasing excitement was palpable in the room and a great step in the right direction. Poker focused on their colorful characters, and we can certainly hold our own with them on that front. One thing they do have that we don’t is a mindless game. Take the people reading skills out of it, anybody can learn the rules. Anyone can play pocket rockets. Horse racing is a cerebral game, ‘a game of skill,’ as my friend Rich Nilsen is telling you everyday. That, unfortunately is our biggest obstacle in this short attention span, instant gratification world that we live in. Eventually, we’ll figure it out, but until then things are not so bad. The winner received $800,000 last year! The overall purse has increased over ten times in just 16 years. Where else in this game have they seen growth like that? Nowhere. 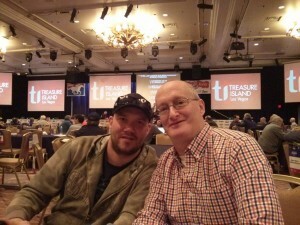 If you didn’t make it to Vegas this year, check out the live podcast. It really is pretty good and watching it will make you try harder to get there next year, I guarantee it! 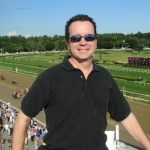 * Editor’s note: Steve Wolfson, Sr., well known horseplayer and son of Harbor View Farm owner Louis Wolfson, was also instrumental in the creation of the NHC. Don Johnson knows math. He knows what it takes to gain the “edge” needed to profit at the end of the day. By exploiting the VIP system and employing his outstanding blackjack skill to its greatest potential, Johnson took the Tropicana for over $6 million, the Borgata for over $5 million, and Caesars for over $4 million. Mark Bowden of “The Atlantic” explains how this former track executive at Philadelphia Park (now Parx Racing) accomplished these amazing feats. Off the rail and very brave on the lead, Bonnie’s Prospect made every pole a winning one in the second race at Lone Star Park Friday Night. Finishing 36 lengths back in his last race at Sam Houston three months ago, Bonnie’s Prospect fought all the way as the pacesetter win the one mile event for a $4,000 tag. The Suave Prospect gelding paid a whopping $82.00 to win despite a good work tab and even a bullet work a couple of weeks prior to race day. The 7 year old stopped the timer at 1:40.25 and triggered an exacta of more than $1,000 for only a $2 wager! Bonnie’s Prospect was ridden by F.T. Rodriguez and now has a career bankroll of $89,000. Owned and trained by Gilbert Ciavaglia, Bonnie’s Prospect has started 52 times, has 11 wins and a total of 22 in the money finishes. Stanford Dolly, an old racing warrior, made her first visit to Keeneland a productive one by capturing the third race of the Spring 2012 meeting. The 7 year old mare shipped from Gulfstream Park returning to a sprint distance and changed surfaces as well. The Bob Hess trainee sizzled through the stretch on Lexington’s artificial surface to win the $10,000 claiming event by a length. Stanford Dolly was last to leave the gate and closed 9 lengths from the quarter pole to defeat her foes. Owned by Roddy Valente and Thomas Lemme, the bay mare was ridden by top jockey Kent Desormeaux. The daughter of Breeders’ Cup Classic winner Volponi recorded her 14th career win. The effort resulted in her 30th in the money finish out of 50 lifetime starts and increased her career earnings to more than $240,000. Stanford Dolly paid $9.40 to win. Digger Karakorum, claimed in his last race by trainer Richard Dutrow, captured Aqueduct’s final race Saturday afternoon (3/3/12) to notch his seventh career victory. Ridden by Mike Luzzi the New York bred increased his career earnings to more than $150,000 after securing the winner’s share in the $7,500 event. The six year old broke alertly and stalked early leaders while staying on the rail then blasted to the lead with about 100 yards remaining, drawing off in full command. Digger Karakorum covered the six furlongs in 111.35 and paid supporters $8.20 to win. Sired by Goldminers Gold the chestnut gelding is owned by DTH Stables and has an impressive 19 in the money (top 3) finishes from 32 lifetime starts. Sea of Dreams splashed joyfully to victory at Sam Houston Race Park Friday night in a $25,000 event taken off the turf. The six year old daughter of Smart Strike went to the front and maintained the lead under tight restraint until the top of the stretch in the five furlongs contest. Rider Glen Murphy asked her to pick it up on the sloppy track when she turned for home and the Karl Broberg trainee had no trouble finishing off her foes. Owned by Danny Caldwell, Sea of Dreams broke the $100,000 career earnings barrier with the win and recorded her sixth visit to the Winner’s Circle in 29 starts. Sea of Dreams has been in the money 15 times in her career. The mare paid $4.00 to win as the even money favorite. Clever Performance, a gelding claimed three times in the last six months, sailed to victory with an excellent performance Saturday afternoon (1/21/12) at Tampa Bay Downs. Starting from the far outside, Clever Performance was heavily restrained by rider Ademar Santos for the first half-mile of the Mile and 40 yard contest. The roan gelding pulled his way to the lead at the quarter pole and when asked for his best at the top of the stretch Clever Performance cruised to the wire, holding off a heavily bet favorite and another late runner in the process. The four year old is owned by Juan Arriagada and trained by Anthony Pecoraro. Clever Performance stopped the timer at 1:42.01 and paid a whopping $31.00 to win. The son of sire Da Stoops has six wins from 21 races and 14 in-the-money finishes with career earnings nearing $40,000. Clever Performance was purchased at OBS (Ocala, Florida) in 2010.